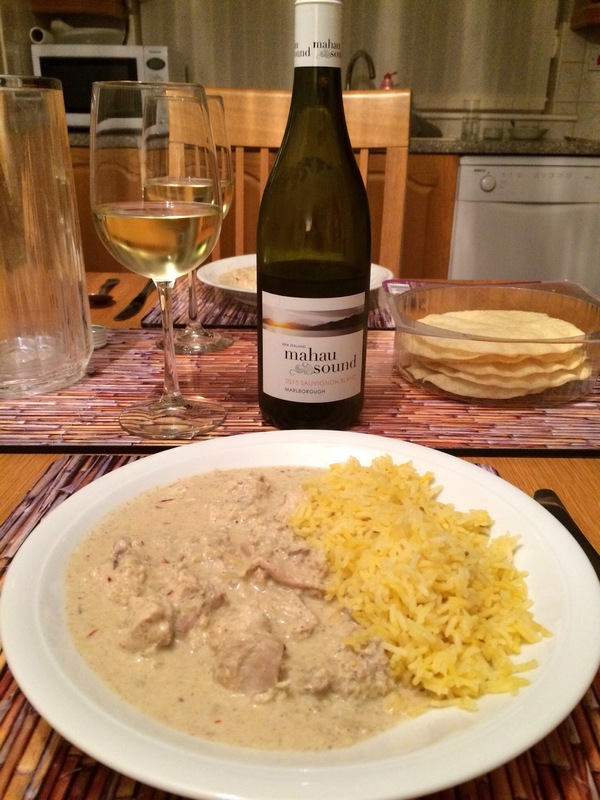 Which White Wine with Rick Stein’s Moghul Chicken Korma? We tried Rick Stein’s Moghul Chicken Korma. Chicken pieces are marinated in a spice paste containing ginger, garlic, water, cinnamon, cardamon, coriander, nutmeg, yoghurt and salt. The chicken is then simmered with fried onion paste, ground almonds and more water. Green chillies, ground poppy seeds and saffron rosewater are then added and the dish is finished with double cream. We served with pilau rice. We opened a bottle of Mahau Sound Marlborough Sauvignon Blanc 2013, a New Zealand white from Sunday Times Wine Club. We detected freshly-cut grass on the nose, followed by citrus, pineapple, grapefruit, gooseberry tropical fruit flavours, with a creaminess and a tangy finish. A very good match with the Korma. We had the leftovers the following day and wondered whether a slightly drier wine would work even better. We tried a bottle of Villa Maria Marlborough Sauvignon Blanc 2014, a New Zealand white from Costco. It was not as good with the Korma, so we set it aside in favour of an off-dry wine, Houghton Margaret River Sauvignon Blanc Semillon 2013, an Australian white, also from Costco. We tasted zesty lemon, gooseberries and tropical fruits. This was the best match of all three wines.